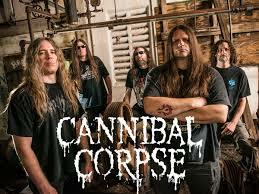 Pat O'Brien, lead guitarist for death metal band Cannibal Corpse, was arrested Monday after his Northdale, Florida home caught fire and ammunition exploded, according to multiple reports. Firefighters were able to contain the flames, but faced difficulty due to the ammo detonating inside the residence causing flames to shoot through the roof. While firefighters battled the blaze, the Hillsborough County Sheriff's office responded to a burglary call at a different house nearby. Authorities told Fox 13 that O'Brien, 53, was arrested after entering the home without permission and refusing to leave. O'Brien allegedly pushed a woman down in the home before entering the property's backyard. Responding deputies claim that they found O'Brien hiding near a fence near his own property and that he charged at officers with a knife and wouldn't obey commands. Police reportedly tased O'Brien to subdue him before he was taken into custody. No one was hurt in the fire nor in the burglary. The musician was charged with burglary of an occupied dwelling, as well as assault and aggravated assault with a deadly weapon on a law enforcement officer. O'Brien has not been charged in the house fire at this time, though police claimed there were military-style flamethrowers in the home.